On Saturday 9th February, Massé will be holding New Zealand’s first ever Bank Pool Tournament, The Bank Pool Battle! Bank Pool is a game where legally pocketed balls must be banked into the pocket. Any ball on the table can be selected and players must nominate pockets, balls and number of cushions to legally pocket the ball. 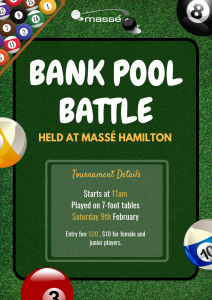 The Bank Pool Battle will be held in Massé Hamilton so read up on the rules and get ready for another awesome tournament! Registrations will be done on the day of the tournament.